Hurried meetings on Capitol Hill might do for social media pushers or app designers. But the business execs in charge of skippering a good portion of the country’s seafood supply to market prefer to slow things down a bit, serving up the delicious fruits of their labor and talking big picture when they sail into town. 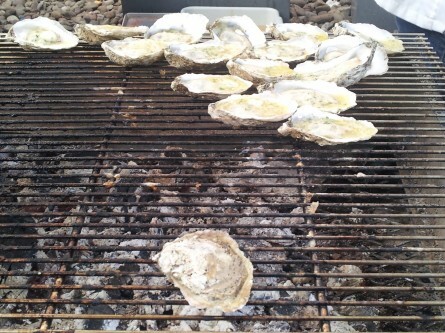 Members of the Gulf Coast Industry Council and the East Coast Shellfish Association will get the chance to do just that during their upcoming “Let the World Be Your Oyster” reception. The annual outreach effort, now in its 20th year, is scheduled to take place Feb. 19 from 6 to 8 p.m. at Acadiana (901 New York Ave. NW). Attendees will be treated to a smorgasbord of regional specialties, lovingly prepared by visiting chefs from across Louisiana. Featured items include: oysters on the half shell courtesy of Acme Oyster House in New Orleans; oyster Rockefeller soup (fashioned from fresh oysters, butter, chopped spinach, Pernod and more) courtesy of Randol’s Restaurant in Lafayette; oysters voisin (fried oysters, creamed spinach, bacon, bordelaise sauce and extra cheese spooned over toasted baguettes) courtesy of Drago’s Seafood Restaurants; pickled oysters with sea beans, radish and caviar courtesy of Cotton in Monroe; open-faced oyster ravioli courtesy of Ruffino’s Restaurants; and charbroiled oysters courtesy of Acadiana toque Jeff Tunks. Chris Nelson, vice president of oyster procurement, R&D and governmental affairs at Bon Secour Fisheries Inc., has been making the trek to D.C. for going on two decades. And he maintains that it’s well worth the effort. “Whether we have a burning issue or not, it helps to make a regular visit,” he suggested, stating that routinely getting in front of solons and staff keeps everyone better connected. Per Nelson, the group has plenty on its place this time around, including concerns about where $75 million in pending disaster relief will be distributed (Mississippi and Florida are already in line; Louisiana may join shortly), as well as immigration (H-2B visas are instrumental) and general recovery efforts (everyone is still adapting to a post-Katrina, Deepwater Horizon spill landscape). Meanwhile, Nelson also wants lawmakers to mull other overlapping issues. His long-range goal is to strike some sort of balance between the government-sanctioned widening of shipping channels and the ensuing damage incurred (spikes in predatory species, fostering of harmful bacteria) by the resulting salinity changes. One that lawmakers, no doubt, will be dining out on for years to come.